Passionate about everything equine? Love checking out new and exciting products made specifically for horses and riders? The Heart to Horse Box is perfect for you! 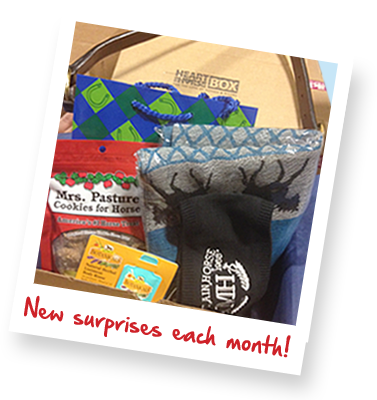 This monthly surprise box is packed with great goodies for you and your horse, and includes products and samples from top brands like Mountain Horse®, SSG Gloves® and Absorbine®. Every Heart to Horse Box is hand-packed with care and filled with tack, treats, apparel and more, all carefully select by our team of equestrian experts. Our monthly mystery box is available as a single order or on a subscription basis, making it the perfect gift for horse lovers of all disciplines (or for youself)! Each Heart to Horse Box comes with a special gift that you can’t see. 25% of all Heart to Horse Box proceeds will go directly to a local or community equine rescue to help provide our equestrian friends with the food, shelter and compassion they deserve. From trail blazers to blue ribbon achievers and everywhere in between, riders of all disciplines and styles can enjoy this monthly box of surprise. The Heart to Horse Box is the perfect way to spread the love, while finding products both you and your horse will love. "Very fun to open up this box, chock full of unexpectedly nice goodies. Very happy with the box and will likely order another with the coupon included in this box. Also, so happy to see Gentle Giants receive the donation this month — what a great charity to start off this program with an oversize impact (Pun intended!)" "I was so excited to get my box! Loved everything inside and know my horses will love the treats. The best part is the 25% going to rescued horses in need. I have 9 rescue horses and haven't been able to help much with other rescues, this gives me the opportunity to do so along with being able to give my horses (& me) something too. I'm signed up for monthly delivery and look forward to the surprises to come." "There is a mix between horse and rider gear. Arrived to my house in about 5-6 days in the rough weather. Came before christmas so that was a big plus. It has beautiful brushes and yummy treats for my horses ... it's GREAT!" I have been buying this box for some time now . I love the surprises inside when it arrives and some of the purchase price goes to charity . Love this, there is always something great in it. I want to help with horse rescue site, also horse.com is a great company. I like how this site is customer oriented. to try new products and to help other horses!! Love a surprise and very happy to help out any rescue! For the surprise and to help out. other barn members get this on a monthly basis and they love it! A Christmas gift for a friend who has horses and enjoys barrel racing. She likes surprises and we both like to donate to charities for animals. These make great birthday gifts, x-mas gifts for other horse owners. Everyone I've sent them to seems to like them. This was a great deal. It was full of products you can actually use. I will certainly order this again. I just want to try. see if it is good. Awesome way to try new products, plus benefits good cause! I love getting a little surprise every month. This box brings me items sometimes of stuff I never would have thought of purchasing before. Most items are really good - some items my horse or I really don't like. I mostly get this box because i know funds go to a horse in need. I ordered this before and loved the items in the box. Christmas for me, my horse and my dogs. Our son & his family have three horses, two dogs and 20 chickens on their little piece of heaven. I know the cost of raising animals so I thought the Heart to Horse box would not only be a wonderful surprise each month but help with the costs. Also, part of my purchase goes to help horses in need. A win, win! I like the products. Also I like that money is donated to help horses in need. It will be like Christmas every month!! Love the idea of helping equine establishments in need. Also, it's like Christmas every month. The products are great & it gives us a chance to use items we may not ordinarily buy! I enjoy the surprise of what I receive and I really appreciate the money going to help the horses. I love the heart to horse box. Can't wait to see what goodies I get for the December box! I found I like getting surprised and I belong to a horse club and I am donating most contents for a chinese raffle to support our club. good Christmas present and goes for a good cause and price. I have 5 horses and i love to try new things. Anything to make them happy makes me happy! It's fun to get a surprise! A FRIEND HAD RECOMMENDED THIS BOX. IT IS GOING TO BE A SURPRISE FOR GRAND DAUGHTER. Will the cost continue to be 34.99 if a monthly shipment is choosen? Best Answer: If you sign up for the auto shipment for the monthly box, you will receive a 10% discount off the advertised price. Can I buy a one year packager for delivery as a gift? Best Answer: You can purchase for one year if you do auto ship. Can we recommend a horse charity? I don't see why you can't. That would be a question directly to customer service. Your charity may already be on their list. I don't know but if I can recommend a worthy horse charity -it would have to be Angel's Grove Ranch in Bush Louisiana. I don't see why not. A charity is a charity as long as it's goal is helping the animals. Yes it could, there are different products that a horse charity use. First box had a leather halter, scarf, horse treats and dog treats and a sample of liniment. Second box had a Lik-it and holder, winter riding gloves, travel mug, mane & tail sample. It seems the cost of the items is a little over what you pay for the box... Some things I'm happy with and some I'm not. I used most of my stuff to put in a basket for the silent auction at a horse awards banquet. It's different every month. The first month I got a leather halter, a winter headband, a scarf/pashmina, some horse wash and dog treats and a gift bag. Second month I got a lixit, travel mugs, wound spray, winter riding gloves, a sample size lotion and more dog treats. I've loved each of my boxes and I think they have been a great value. It's been great getting things I normally wouldn't have bought but wanted. I have received 2 Heart2Horse Boxes so far and enjoyed both of them. Items range from horse treats to human clothing items -- (a few of the items so far: leather halter, horse decorated scarf, Mountain Horse head band, treats, hoof care products, dog treats on occasion too). I have enjoyed both boxes -- fun to see the surprises. I believe the contents change from month to month, or whatever the cycle duration is. I got one for Christmas, it had a regular sized leather halter, a pretty shawl for a human (I really like it), a travel coffee mug, horse and dog treats, and some other stuff that I can't remember. There are a variety of items in each box and the selection is different each month. There have been leather halters, loves, Likit products, coffee mugs, etc. The value of the products far exceeds the cost of the box. Plus, you are helping a rescue group with part of the cost. It was awesome! My granddaughter really enjoyed opening it. It had a beautiful leather halter, a horse scarf, horse treats and dog treats, a cool head band,a gift bag and a 15% off coupon. We let her open it so we were all very pleasantly surprised. My box contained a very nice scarf with a horse print, dog treat samples, horse treat samples, a nice leather halter, and a liniment sample. I was really excited and would love to get them monthly, but other bills come first. It is different every month. so far I have gotten, a scarf, leather halter, horse treats, lick holder with refill and much more. I look forward to getting them each month. It is like opening a present to myself! This is a fantastic box. I loved last month and this month was great! Gloves, Lick-It holder and round insert! Coffee mug, treats and more!!! It's always a surprise! Treats for people, pets and horses. Small gifts like scarves or gloves. Horse treat samples, and other useful things. I got a Pashmina scarf, a leather halter, a Mountain Horse winter headband, and more! It was great! I ordered the February box too! I just want to clarify before ordering. If I use Auto Ship option for monthly deliveries my card will be charged 34.99 each month. Or 34.99 x 12 months, all at once? Best Answer: You will have to pay all upfront, unless you get AutoShip. Five to six in an average box, always the product that is sold not sample size. Are any of the items useful for miniature horses and ponies? Or are they all for full-grown horses? Best Answer: I think that if you find something on their website for a miniature horse or pony and you order it that would let them know that is what you have. Maybe also contact their customer service and ask them. I do believe we received the horse halter because I had previously ordered one. All the other items were good for any person and horse -no matter what size. In my first box, I got a horse halter, in the second box, a horse lik-it ball and holder, and the 3rd a collapsible groom (brush, etc) tote. I usually get treats, and have gotten a scarf and gloves. So you might not specifically get mini tack, but the treats and meds, shampoos, people stuff and dog treats are stuff you can use. The items inside the Heart to Horse Box are useful for all size horses, ponies, people and dogs. The boxes contain super items, fun surprises and make you feel good for participating in a worthy cause ! Do not hesitate to get one, you will love it! Everything except the tack for horses would still be appropriate for your horses. Tack comes in random sizes. It still will contain some stuff for you and treats, supplements, muscle creams, ect. Yes, many of the products are for the rider/ owner, as well. Also included are grooming products, treats, clippers, etc. Lots of product for the price and a helping hand to horses in need. The Heart to Horse is for any horse and rider. Always a nice surprise. It has included horse treats and horse shampoo. I've even received treats for my dog. Mostly for horses the boxes I have bought. The treats will be fine. There is items for people to that come in the box. I believe that they are a grab bag sort of thing. You get random sized tack. It may fit your horse and it may not. The treats could be used for ponie and minis, but the halters I recived where horse size. How can we see which charities our monthly box purchase supports? Best Answer: Hi Loraine, when you open the box there is a card with a description of all the goodies as well as a picture of the horse that you are supporting, it says "My name is..." and what horse rescue /society that is being sponsored. That horse will be apart of that rescue. Hope that helps....I love my boxes and it is a great way to give back and save some money at the same time. Usually when you go to order the box it shows you what the charity for the month. There is also a nice card inside the box with the charity info. The boxes are nice - items can be gifted or used yourself! My first box had a very nice leather halter that I ride in! No but, Heart to Horse Box will donate 25% of net proceeds to local community rescues in need, to help support our mission to assist all horses to find a forever home. There is a little card that comes in the box that will inform us of where the donation is going from the purchase of our box. Each box has a card in it that describes that month's charity (as well as contains a little blurb on each of the products). There was a card in the box that talked about the charity. There is a card in the box. Could there be saddle pads in boxes? Or riding clothing? Best Answer: In the Dec. box there was a mountain horse headband and a very nice horse scarf with several other goodies for your horse!!! I haven’t received a saddle pad or riding clothes, however I have received gloves, socks and scarves. Don't know about saddle pads (as we haven't gotten those yet) but we have gotten hats and scarves. Was I supposed to receive ONE polo wrap for Feb 2016? Seems a little odd. I'd actually use it and likely buy more if I was ABLE to use it! Best Answer: You should have received a set of four!!! Thank you for bringing this to our attention: I put in to have a full set of polos re-shipped to you, no charge of course. Sorry for not responding but thank you for the prompt response and correction of the error. Excellent customer service!! I definitely appreciate it and love the polos. Aside from that and no "free gift" my boxes have all been in order. Took the box of autoship due to finances but will definitely re order when I am able, I am very pleased! That's all I received even though the card said "a set". Perhaps it was a sample. I can use it for a bandage but not as a set of wraps. Sorry Niki, I have no idea! Seems weird. how would a charity get on a list? Best Answer: I believe you would have to get in contact with Horse .com and ask if there is a form to fill out, and then be processed and put threw a waiting period? That would be my guess. Hope it helped! Creative discussion - Speaking of which , others need a IRS W-2 , my friend came across a fillable version here https://goo.gl/pP08gj. I think the charity would just need to contact the company or a generous donor could subscribe for them! There used to be a page where you could recommend a Horse Rescue, where is the page? love the horse box, get good stuff and donate to horses in need. I just bought the box, don't know about a rescue. Sorry! Can I order past months of the Heart to Horse boxes? Best Answer: Unfortunately not. We can check on the contents for you if there are particular items you want? Can I order it to be delivered for two months as a gift? Best Answer: Certainly! You can do an Auto Ship and cancel after two months, or you can do a one-time order twice. Yes you can , just order it each month and not auto ship. I pick up my box today. Are they all different? My box has the small clippers, but there is a bag of dog treats in it? I don't have a dog and I'm pretty sure my horses would prefer the horse treats. Also no slicker block in it as well??? I am signed up to get this every month but am concerned now about doing that. Loving this box a month especially because its a gift from my father and he is unfortunately in heart failure and he wanted something that would remind me of him every month. Each month is a different box. We may occasionally send along some extra items such as treats for dogs and cats. I realize that each month is different. Thats what makes this fun. I was just wondering if everybody gets the same products in their box for that month? I ask because the picture of Marchs box has a slicker block and horse treats I did not get. Will the price still be 34.99 each month? Best Answer: Yes, the price has stayed the same. I have used some of the items that I didn't need or want for birthday or Christmas presents to friends and the best part is the I have it on hand and it is already paid for. I have enjoyed my Heart to horse box, so many items that I can use and a few that have made great presents. Yes, that is the price, if you get it shipped monthly with " auto ship " it is cheaper. We love the box. Lots of fun, new stuff. Yes, with a shipping cost also. Runs about 38 dollars. Yes, price is always the same. I have been getting the box of goodies each month for a year and have received some duplicate items over time. I thought it was to get to try new products each month? sometimes you can get duplicates. but alot of times i give away to my friends to see if they like it. and then tell them how i got the items. also i save certain things for auctions at our meetings or trailrides. I've gotten duplicate items too. Some months are better than others. I love receiving my box, but admittedly was disappointed with this past box. I agree I've got a lot of the same stuff after doing it for over a year. I love my boxes though just would prefer not to get duplicate items. I think they may send duplicates to get rid of left over stock. Especially if it's seasonal items. How much money is it to get the package every month ? Best Answer: These are a great way to get new fun products as well as donating money to good causes. I haven't done this in a while, but since I was requested to answer this question, I think I shall get back into doing this. When I used to get these in early 2015, shipping was free. I do not know if that will still be the case. I need to look into it. I certainly hope that is the case though. Just another benefit to this very cool offer. $35.00 of which 25% of the proceeds go to a rescue. There is a note as to what rescue is receiving the donation. As far as what's in the box...it's a surprise each time you open one. I've found that there is usually an animal treat- horse or dog- a few items for your equine friend and a few items for you. A detailed card is included in the box describing all items. There is an additional 10% discount for Automatic Shipments. $31.50 per month. I love the box! do u have to pay each month? Best Answer: This is available both as a one-time purchase and as an automatic shipment. If you do have it set up as a monthly delivery, then yes the card you have on file will be charged each month. No you don't have to pay each month. You order a box when you like to with no strings attached. I order when I can and there always something I need or give as a gift. The wound spray and probiotic are set to expire soon. My gelding doesn’t wear pink wraps, the over the head belt doesn’t go over my head, the Hooey bag will won’t last. The socks are the only usable thing I received. I’d like a refund but shouldn’t have to pay for shipping? Best Answer: I stopped getting the boxes because most of the items were things that I would never use. As for sending it back I can't answer for horse.com but if the items are that back they should just give you a full refund and give you a return label. That seems the right thing to do. I also stopped shopping from them all together because their 25 or 30 % discount was never a true discount because they raise the actual price of the item and then discount it. It's very unfair. I put my complaint on their Facebook page and they replied fast. I sent them the info they wanted today, so now it’s a waiting game. It took a while but I finally got a full refund. I’ll never order from this company again. I would call and get a refund. I cancelled my box after I continued to get duplicate things over and over again it's a fun idea but way too many duplicates. Maybe they will exchange the stuff that doesn't fit or is the wrong color? They replied to my complaint on their Facebook page. I sent them the requested info and now waiting. Please call our Customer Care team for assistance. We are available 8AM-8PM weekdays, Eastern time at 888-653-0026. The question has come to a fellow shopper not the company. Is this geared to English or Western? I do not think I got the box for February? There was some problem with my credit card changing and I gave the new credit card # but I did not get the box. I appears that I was charged for it. Please let me know the status of the Heart to Horse box for February. Yess that happen to me aswell!! Will it stay this discounted price every month if you buy it at the price? Best Answer: It might not be the identical price indefinitely, but we do discount our products all the time, and you can save even more if you sign up for automatic shipment. it has always been $31.50 since we started getting it! Are what they show in the boxes exactly what comes in the months shown? Best Answer: I don't remember if it was exactly what was shown. I was not paying too much attention as it was a gift for my daughter. It was a good value though. Every month a different set of surprise mystery items is shipped out. Are there different sizes? Because I'm getting a Belgian, Percheron cross and I was wondering if you had different sizes?? Best Answer: I don't honestly know if they will exchange the size of the tack in the box, mine came with a Leathet Halter that luckily fit my 16.3 hh gelding that didn't fit my 15.2 hh mare, he is much stockier and built like a warmblood, I would honestly call customer service and verify what they would do! The box is a wonderful compilation of assorted horse care products, plus part of the proceeds helps a specific horse rescue. For example, my box included some horse treats, a scarf, and mini Wahl clippers. It is not breed specific but well worth the purchase. Unfortunately there are no size choices available for mystery box items. Most things don't involve a size, but when they do, it is average horse size. do i get to pick the month? Best Answer: I am fairly sure that you can. They ship on the 15th of the month, so if you get your order in by then, you will get that month’s box. It’s always a surprise. I have thoroughly enjoyed getting them every month. My favorite is the December box. This box ships on the 15th of each month, hand picked items. 2-16-17 My son gets me a Horse to Heart box on auto ship each month. Each month I get a 15% off coupon in the box but have no way to use it since I am on auto ship. Wouldn't it be fair to give the auto ship people the same discount as you do to random customers? Best Answer: Unfortunately there is no combining of discounts. Heart to Horse boxes do also have their own additional discount applied for regular automatic shipments. Why even put it in the auto ship box? If I choose a monthly shipment, how will the cost be charged? upfront or monthly? Best Answer: If you choose to have this item shipped to you every month you will be charged monthly once the item ships from our warehouse. Its a one time charge, unless you have an Auto ship. Just wondering why only Gentle Giants Rescue gets the benefit. Many other rescues need the help as well. I have tried to ask for donations for our 501(c)3 But am never answered. Wish you would distribute the benefits more evenly? I need to cancel future orders at this time, where can I do this? Best Answer: Please contact our customer service telephone line we will be more than happy to assist you!